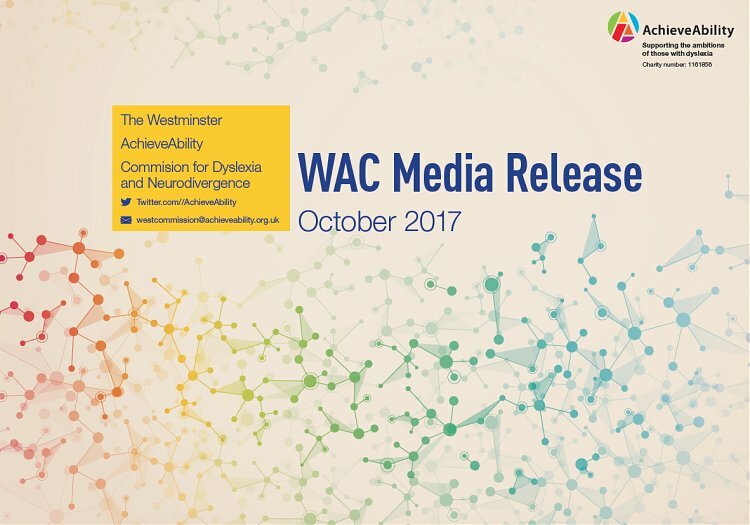 This guide goes towards fulfilling one of the WAC recommendations (Recommendation one) and is for HR professionals to learn more about Neurodiversity to raise awareness amongst employers. For HR to take action in the hiring process and to support their ND staff to achieve their potential. As part of WAC recommendations one and two. We are now asking that the CIPD and Department for Work and Pensions (DWP) link up to devise training programmes to ensure greater awareness of Neurodiversity to organisations and government offices. 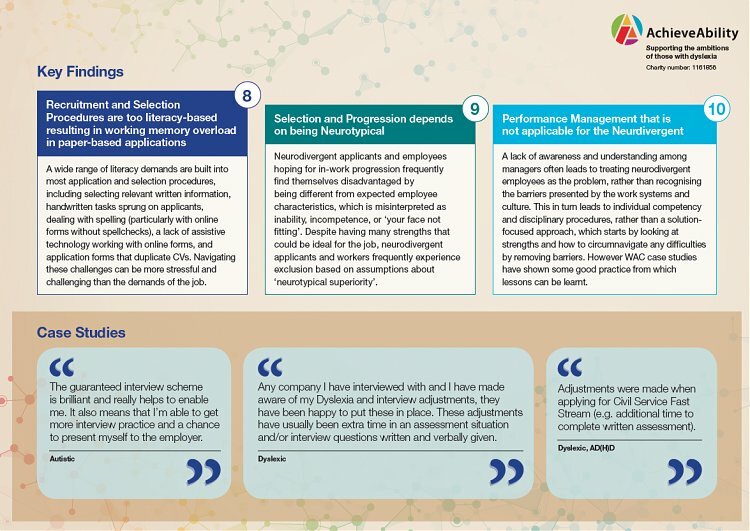 These training programmes to inform a DWP good practice recruitment guide by building on the existing DWP toolkit. In December 2016 Experts provided evidence to the Commission: Nasser Siabi OBE, Microlink, Chris Rossiter, British Psychological Society, Margaret Malpas MBE from the British Dyslexia Association and Andrew Sutherland lead on the ACAS report. Surveys were conducted to gather further evidence to feed into the government goal of ˜Halving the Disability Employment Gap by 2020. The result will be a report to find out how recruitment and probation processes might be improved and to highlight good practice in these areas. 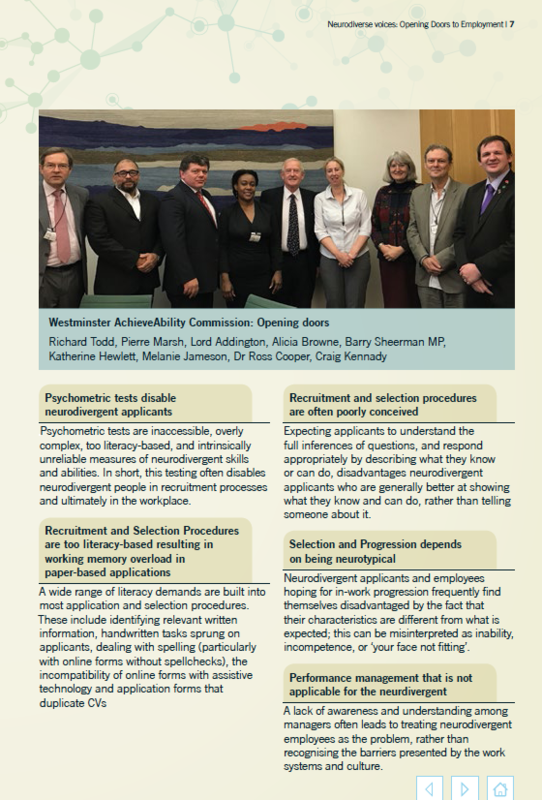 The Westminster AchieveAbility Commission on Recruitment is user-led and focuses on adults with dyslexia and neurodivergence in the UK. It has been formed from a collaboration of AchieveAbility, the Autism Commission, the Dyslexia Adult Network and the Dyspraxia Foundation. Barry Sheerman MP is our Chair and Lord Addington, our Adviser. 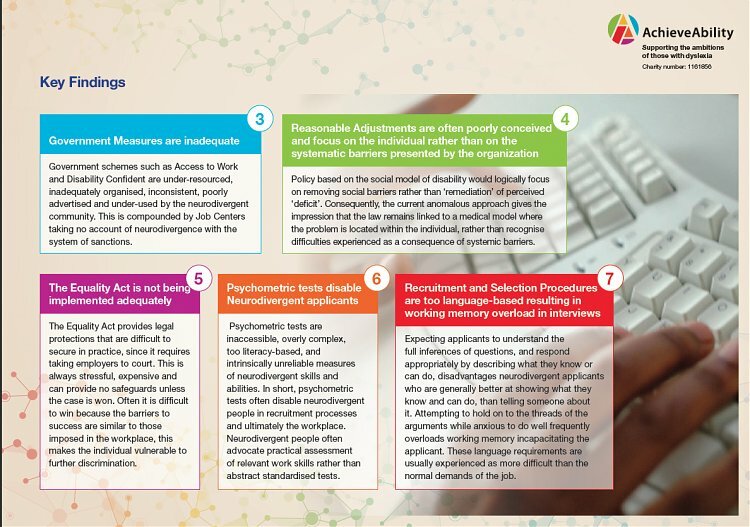 Our task is to investigate the barriers to employment in order to identify which recruitment processes disadvantage neurodivergent people (those with ADHD, dyslexia, dyspraxia, dyscalculia, autism and Asperger Syndrome). Since this population represents the highest percentage of adults who are disabled, the Commission is vital in order to represent the issues for this community, as well as revealing their value and strengths within the workplace. 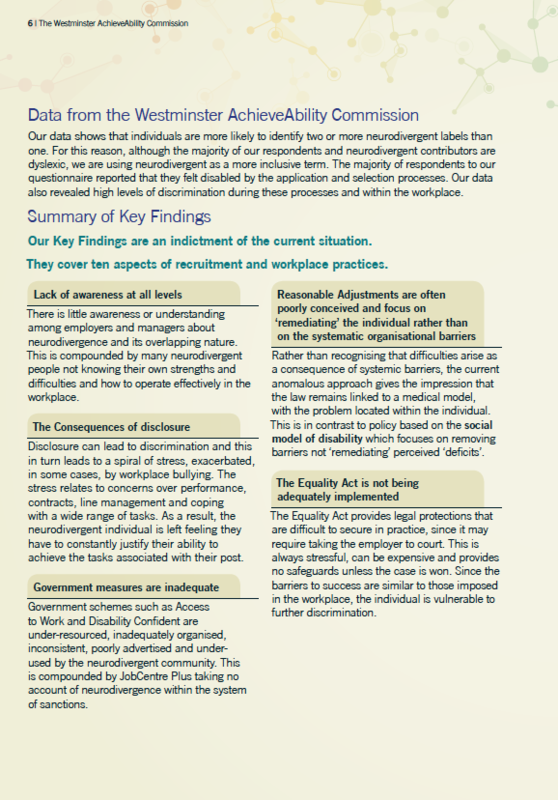 The work will provide much needed evidence and build on the research of recent reports such as 'Neurodiversity at Work' (ACAS) and Ahead of the Arc (Disability Rights UK). In our first witness session, experts provided evidence to the Commission were: Nasser Siabi OBE, Microlink; Chris Rossiter, British Psychological Society; Margaret Malpas MBE British Dyslexia Association and Andrew Sutherland, the lead on the ACAS report. Two further key witness sessions took place early in 2017. ‘Policy and Practice’ which included employers such as the BBC and Transport for London, along with employability specialists. Followed by, the ‘Neurodivergent Voice’, which gave an opportunity for invitees throughout the Neurodivergent community to voice their points of view. Surveys to (potential) employees and employers have gathered further information. Our final session was an opportunity for the Department of Work and Pensions to respond to some of the issues raised. All this evidence will feed into our full report in 2018. Our overall aim is to find out how recruitment and probation processes might be improved and to highlight and disseminate good practice in these areas. 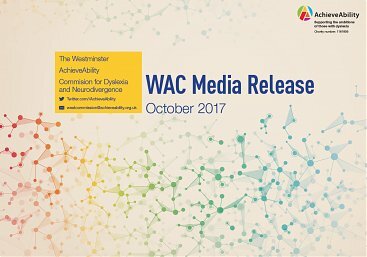 A Media Release providing the evidence headlines will be launched during Dyslexia Awareness Week October 2017. The full report is due in January 2018. The work of the Commission will provide other campaigning groups with a platform from which to push this agenda further, aligned with the government’s stated aim of increasing the number of people with disabilities in employment as set out in the Improving Lives Green Paper. 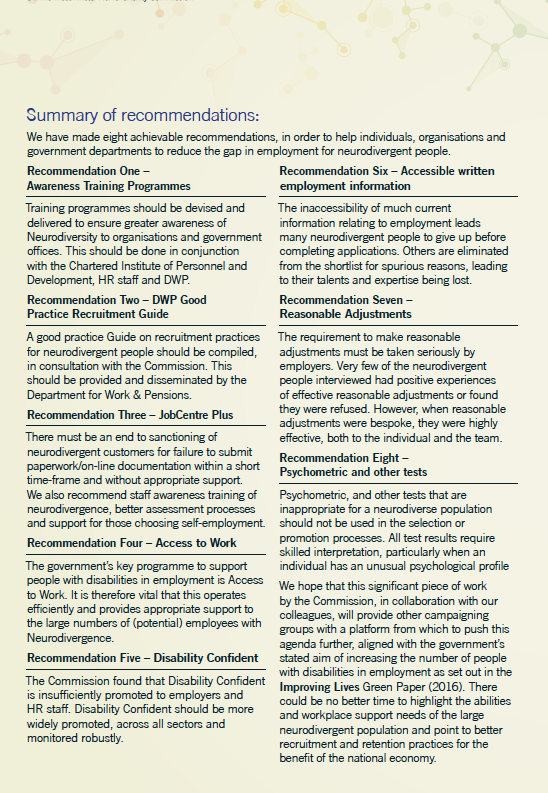 There could be no better time to highlight the abilities and workplace support needs of this large neurodivergent population and point to better recruitment and retention practices for the benefit of the national economy. 40 people attended the session. With 10 neurodivergent people giving evidence. 1. 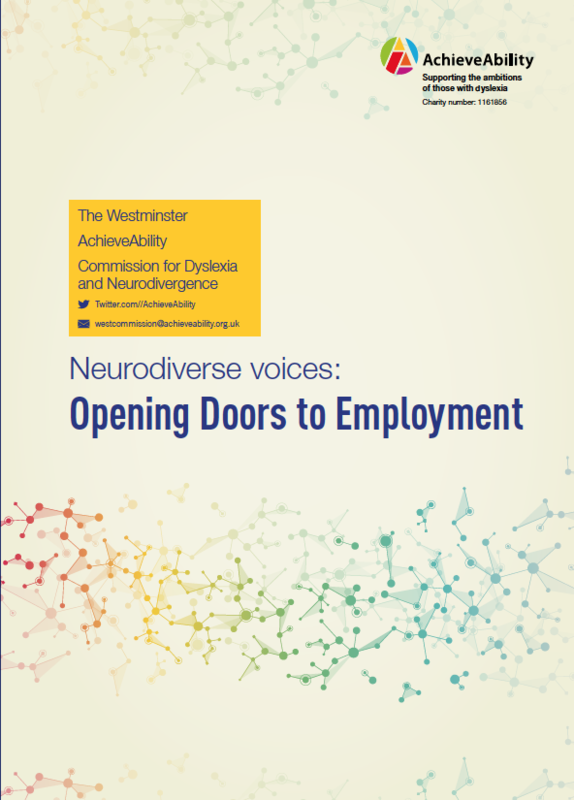 What are the barriers for dyslexic and neurodivergent people in employment? 2. What are the recruitment processes that disenfranchise neurodivergent people? 3. What might be done to improve recruitment processes? The session took place on Monday 20 March and covered the following topics: recruitment processes, equality impact assessment, Psychometric tests, uncertainties employers feel, reasonable adjustments , disclosure, examples of good practice, Disability Confident and Access to Work. If you are an Employer with dyslexic and neurodivergent (autism, ADHD, dyslexia, dyspraxia, dyscalculia, asperger's) staff please could you participate in the above survey. We will be having a further evidence session in March to hear from the workplace and the survey with this evidence session is important to the final commission report. We already have had over 600 responses to the survey for the dyslexic and neurodivergent voice. If you are dyslexic/neurodivergent (autism, ADHD, dyslexia, dyspraxia, dyscalculia, asperger's) please could you participate in the survey. Dyslexia and Neurodivergent-friendly approaches to job recruitment “ wouldn't that be a goal worth pursuing? This issue was identified following a recent meeting in Parliament, initiated by AchieveAbility, on matters affecting adults with Dyslexia/Neurodiversity. It is to be investigated through the establishment of a temporary commission, running for twelve months from October 2016. This will be a multifaceted piece of work, championed from within Parliament in order to have the maximum impact. As Chair of the Dyslexia Adult Network I have been invited to join the working group. In our initial meeting (July) we considered evidence to justify a commission, mapped out the process and determined the key players. There has now been a second meeting (October 2016) to plan the Commission work: Barry Sheerman MP, will chair, and Lord Addington (well known to BDA) will advise. What data exists to demonstrate that dyslexic/neurodiverse people have a greater chance of unemployment? What are the barriers when they seek to take up employment? 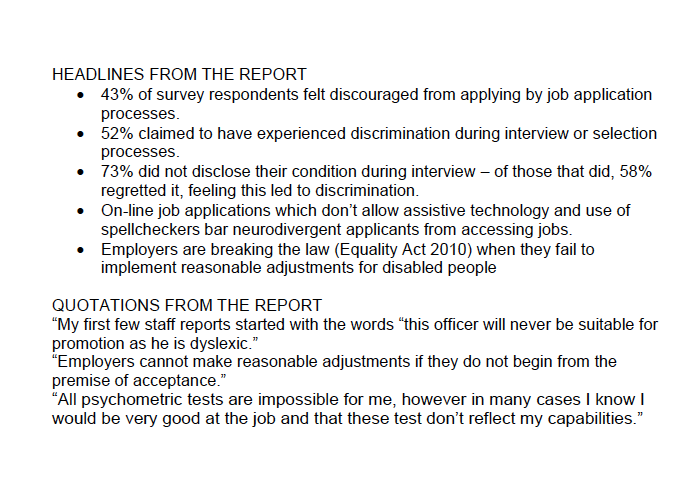 What are the recruitment processes that disadvantage dyslexic/neurodiverse people? What might be done to improve recruitment processes? The necessary information will be gathered in various ways: through a call for evidence, a survey, and through witness from experts invited to present to the Commission. Bearing in mind the neurodiversity of the population who will wish to contribute, our methods will include Skype and input from those who prefer to express themselves visually. In addition to documenting the barriers, case studies of good practice will be sought. There will be surveys as the first stage of evidence gathering followed by a more formal call for evidence goes in the New Year. The focus will then move to pulling out recommendations and considering the overall shape of the report. When the Commission meets again in July it will initiate report writing and finalise plans for publication. We plan to launch the report during Dyslexia Awareness Week in October 2017. 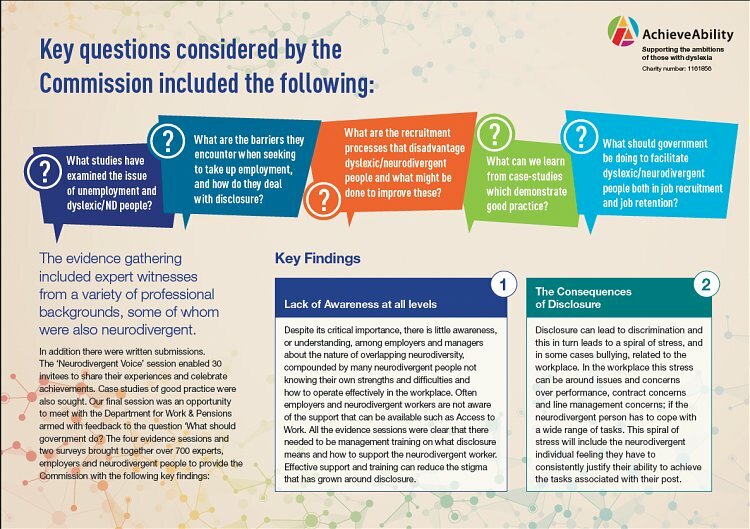 We ( Hidden Impairment National Group) have launched this site today for employers to gain more understanding about supporting people with for example Dyslexia, ASD, ADHD , Dyspraxia(DCD), Dyscalculia, Language and Communication Challenges. National Group. It was originally set up to provide some guidance for the Department of Work and Pensions (DWP). We are looking for case studies of your workplace where you have had some positive experiences either as an employer or employee to show case. Feedback thoughts and any additional strategies you may think are of help to others. Do join our email list and/or social media discussions. To mark Dyslexia Awareness Week, the British Dyslexia Association is promoting a special offer: they are making their e-learning programme for adults available for FREE. Entitled Success at Work and Home, this 10 module programme allows you to make the most of the strengths dyslexia can confer. It's also packed with advice for finding your niche in life. It has been developed by Margaret Malpas. To access this, email: elearning@bdadyslexia.org.uk and quote DAW adult programme. October 5th is World Dyslexia Awareness Day – and the Dyslexia Awareness day in England & Wales designated for Adults. 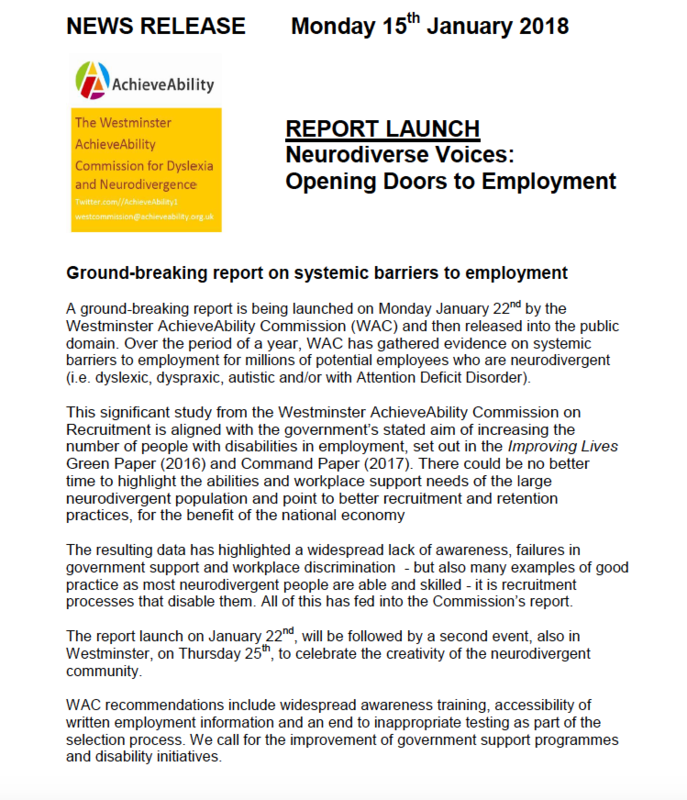 Readers of Network News will be aware of WAC - the Westminster AchieveAbility Commission set up to investigate barriers to employment, identify recruitment processes that disadvantage neurodivergent people and highlight good practice. WAC has now gathered evidence from up to 700 respondents, called expert witnesses and heard from government. This data will enable us to produce a comprehensive report with recommendations to launched in January 2018. 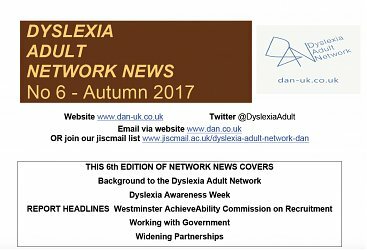 Meanwhile a Media Release has been prepared for World Dyslexia Awareness Day on October 5th – and is being disseminated along with this edition of Network News. 1. The REFUND project: at grassroots level, AchieveAbility is working with Camden Single Homeless Project, St Mungos, the Euston Partnership and Islington Multidisciplinary Floating Service to provide educational opportunities for staff and their clients, (who are recovery). Research has shown that there is a high incidence of self-medication and homelessness for people who are Neurodivergent (Disability Today 2014). So far the REFUND project has reached 35 people through training sessions and short courses to raise awareness of Neurodivergence and the strengths of Neurodivergent people. To provide skills development in: communications, IT, Literacy and entry to the workplace. The REFUND project is now entering Phase Two, bringing the service to the wider Single Homeless Project London community. 2. Job Centre Plus in East London have now requested that AchieveAbility provide awareness sessions on Neurodivergence to JCP staff. Two sessions have taken place in Waltham Forest and Redbridge. Redbridge and AchieveAbility now have a referral system set up for signposting JCP dyslexic clients to relevant opportunities and advice. 3. Next Step Programme (upskilling into work)- AchieveAbility is working with Waltham Forest Dyslexia Association to provide the Next Step Programme. This programme is to be delivered in three stages leading from basic literacy and numeracy to the now established Next Step course for dyslexic adults who wish to upskill or return to the workplace. DAN has recently established links with the APPG for AT. 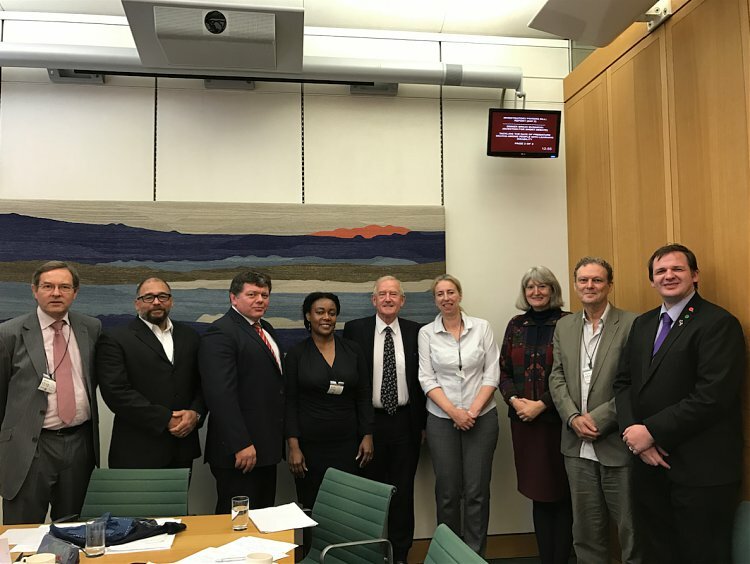 This group was launched in March and has already held two events in Parliament and plans more for this year (to receive notice of the group’s events, sign-up to its quarterly newsletter here). The all-party think tank Policy Connect acts as the secretariat for the group and has appointed a new group manager, Robert McLaren. Robert is himself dyslexic and an AT user - and has joined the DAN Jiscmail. DAN looks forward to continuing to work with the APPGAT to share information and ideas and promote each group’s activities. 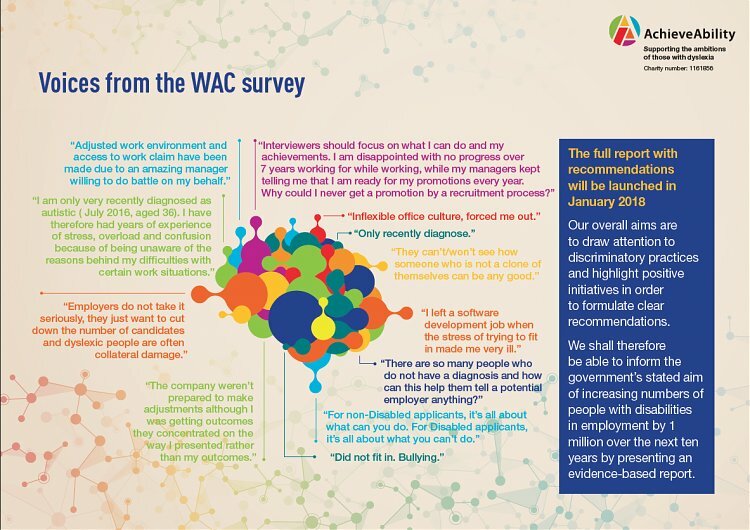 Prof Victoria Wass, statistician and one of the authors of Ahead of the Arc (the response to the Work, Health & Disability Green Paper ) is keeping us updated regarding her follow-up meetings with DWP, BEIS, the Treasury and the Work & Health Unit. 2) the absence of ‘disability’ in the main government strategy documents dealing with the economy and employment. Visit the website https://www.musedcn.org.uk/ to see several items relating to dyslexia/neurodiversity. The next edition of DAN Network News will carry a report of the project Museum of the Labelled which is gathering people’s thoughts and experiences, positive and negative, in order to raise awareness of neurodiversity in society. Jess, the project leader, (who I am mentoring) aims to do this by delivering a participatory art project and by locating relevant museum objects. Offer of free sessions from Nancy Doyle: recruits needed! Nancy informs us that she needs participants to complete her study on coaching workplace strategies. To this end, she is running FREE coaching workshops in London and Brighton in November and February - there are currently 4 spaces left in Brighton (Thursday 5.30-8pm) but about 25 spaces in London (Wed 5.30-8pm or Sat 10-12.30pm). Participants need to come to a 1:1 assessment in October, Dec and Jan, and then attend the 6 workshops in either November or February. In case anyone has not heard, it has been found unlawful to charge fees either to claim or to proceed to a hearing. This applies both to Employment Tribunals and to Employment Appeal Tribunals. Fees paid should be returned. DAN welcomes this news. Please let us know if you come across anyone who has had their fees returned. I have been doggedly following up various new senior DWP contacts, available to us after the Westminster Commission session in which the strategic lead of Access to Work was invited to respond to concerns that had arisen. These concerns echo the problems that you have brought to the attention of DAN. We are also asking WHY workplace-needs reports have become anonymous and if this is now official policy. i) An unrealistically tight turn-around time between first contact and the finished report which has a number of implications - from personalised, appropriate well-sourced recommendations to the difficulty of fixing appointments for assessor, employee and line manager at very short notice. ii) Poor awareness of dyslexia/ND amongst AtW Advisers and the Call Centre which initiates the process. iii) Inadequate quality controls, particularly the absence of any routine measurement of adequacy and effectiveness of the assessment, and recommendations for the employee and employer. DAN is returning to the job of raising awareness. We plan to make an e-learning programme available for AtW Advisers and the new Disability Employment Advisers, while offering face-to-face training for the Hidden Impairments Team in Halifax, with the back-up of Yorkshire MP, Barry Sheerman. I am chasing up old and new DWP contacts to take forward issues relating to Disability Confident: How can take-up be promoted? How is it monitored to ensure that the three levels of DC status are evidenced in the organisation? 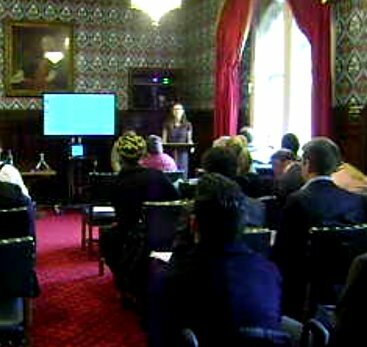 We have also been able to feed in findings from the Westminster AchieveAbility Commission surveys. The last edition of Network News reported on the APPG on Disabilities at which Professor Hoque questioned the success of this initiative. Finally, we are trying to get answers to questions regarding the Work & Health Innovation Fund. I have been in correspondence with the appropriate DWP staff member to enquire about uses of this £40 million Fund and the application process. Surprisingly, neither question can be answered, despite a presentation from the Work & Health Unit to the Hidden Impairments National Group as long ago as March 2016, entitled ‘Improving health & achieving work’. So, more evidence of disarray and delay in government – but if anyone has a proposal, contact me ( mj@dyslexia-malvern.co.uk ) and I can supply the emails of the policy team for an initial consideration. 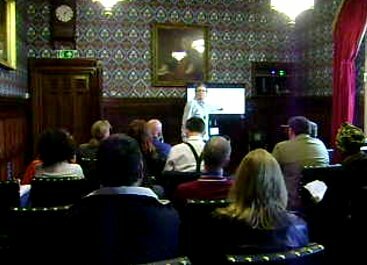 DAN is connected to three APPGs – on Disabilities, Dyslexia and Assistive Technology. We shall continue to use these forums to raise concerns, make alliances and strengthen the voice of the sector. This is particularly important, given the emphasis of the government disability employment agenda on people with health conditions. Better news regarding (Specific) Learning Difficulties and Learning Disabilities (LDD) in prisons: Prison Governors are now ‘empowered’ to commission extra services, within agreed funding streams, which include assessment of LDD. It is stated that 29% of prisoners fall into these categories, which I would divide as follows: 19% with one or more Specific Learning Difficulties (according to solid research in 2005 by Dyslexia Action) and 10% with a learning disability. - all prison information, forms and digital systems to be available and/or designed with suitable adaptation to support those with dyslexia. So, more follow-up to do, to ensure that good practice is put in place……. Message from the Chair Greetings, all. UPDATES from DAN First of all, we welcome AchieveAbility onto the DAN steering committee. The two groups had already been working closely together through regular contacts between DAN Chair, Melanie Jameson, and Katherine Hewlett of AchieveAbility. 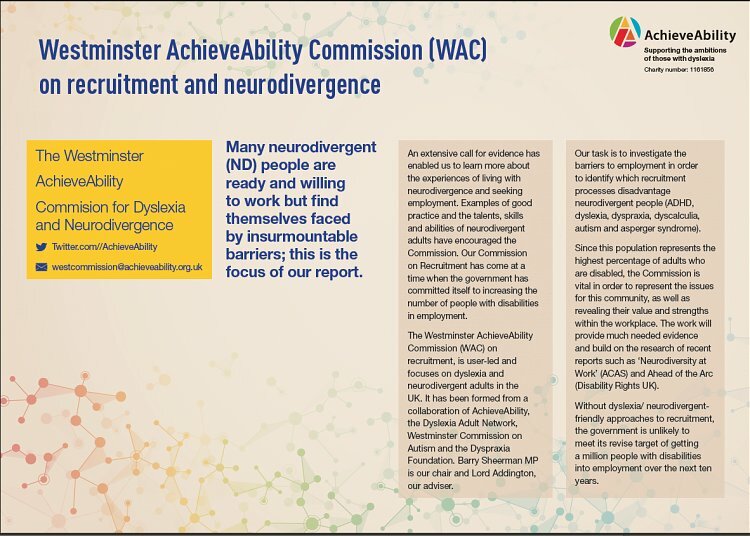 This co-operation increased when Richard Todd (who represents the Dyspraxia Foundation) and Melanie (for DAN) became part of the Westminster AchieveAbility Commission on Recruitment and Dyslexia/ND. Much of DAN's energies have been taken up with engaging with the government is long-stated aim of ˜Halving the Disability Employment Gap and responding to consultations both from the All Party Parliamentary Group on Disabilities, and from the DWP, on shaping this initiative. Becki Morris, our Communications Officer, reports on an SpLD conference on adults at Sheffield University on February 9th (@SpLDSheffield) hosted by The Codpast (@thecodpast) and the SpLD Society with Dr Julian Elliott, Lord David Blunkett and Professor Rod Nicolson, among others. The ensuing debate can be followed on #SpLDdebate17. The twitter discussion focused on Elliott as usual theme of whether the word ˜dyslexia' is useful. It was emphatically agreed that questioning the existence of dyslexia, and therefore not offering support to students and school pupils, was wholly inappropriate. More than this, the focus should be to concentrate on removing stigma and misunderstanding, before we start challenging the actual word ˜dyslexia. It was agreed that dyslexia was not just linked to reading problems, but encompassed other areas such as working memory and organisation.